So, projects take a long time to marinate around here. For example, I tore apart the basement bathroom 2 years ago, and only this spring did we admit we couldn’t put it back together again and hire a contractor. Our laundry room has been terrible since we moved in- the previous owners put in drywall, and great cabinets, but then they just stopped- no tape, no mud, no paint. They had a solar water heater system, which I assume worked for them, but I don’t think the renters who lived here before us used it, and we haven’t hooked it up again. The panels are slowly decomposing on the roof, and the water tank has been taking up about 4 square feet of floor space in the laundry room, and even bumps out into the stairs. 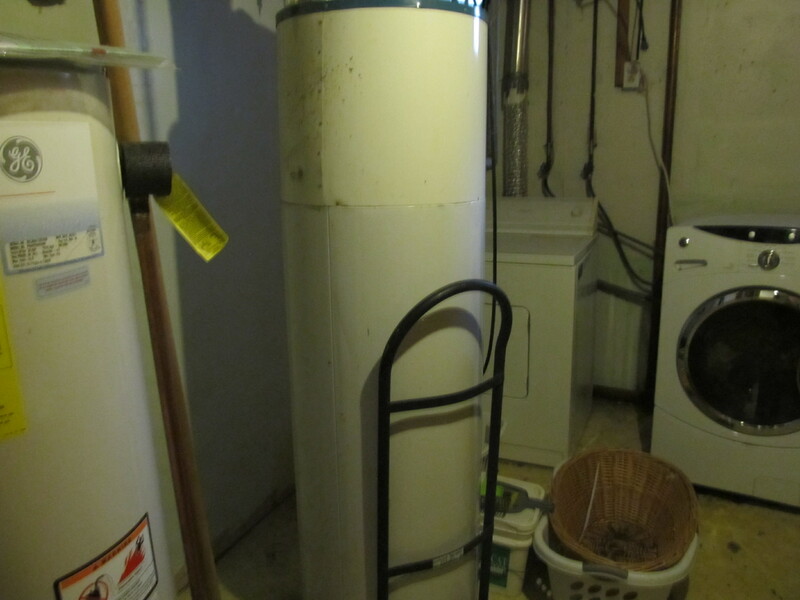 There is also another dead hot water heater that has been taking up space as well. That is where the title of the post comes from. One of my colleagues this spring was house hunting in Fort Collins, and she was quoting home prices in terms of square feet, “Houses in old town are going for 300 per square foot, for an 800 square foot place. With a detached garage, can you believe it?” Well, no, I can’t believe it, because you made me do math first. Just tell me how much they want for the house! I can’t even remember the rest of the conversation, because I was still trying to carry the 1. But it made me think- we have some stupid stuff laying around the house, old paint cans in the basement, two water heaters, a pink toilet (non-operational) in the garage. Two stereo speakers (probably also non operational) up in the loft over the work bench in the garage. How much is that space worth? According to Zillow, our house is worth about $101 per square foot. Those water heaters are taking up more than 400 dollars of space in my house. I was doing some reading recently on the concept of Wabi Sabi- which is kind of like shabby chic, except Japanese, so it is much cooler. The idea is that the things you surround yourself with should be imperfect and worn, and furthermore, don’t surround yourself with too many things- they could be curated, not cluttered. As always, as a white girl interpreting a Japanese concept, I am sure there is a lot more to it than that, but one of the things that stuck out is the lack of clutter. A house should have 10% of its space as storage. You should be able to put things away. So, even though I spent maybe 5 minutes a day in the laundry room, I am making it nicer, getting rid of crap, adding shelving so that it can store more of the things I need and want. I taped and mudded the joints on the drywall, then painted with some leftover paint. I knew the unprimed drywall would soak up a lot, so it would need multiple coats. I was able to kill two birds with one stone, for the first coat I got rid of some “indian white” paint that has been taking up space in the laundry room for at least 12 years, and I was able to brighten up the room considerably. Now a corner niche is pale green, and two walls are “aegean mist” left over from Kate’s room. It has made me so happy. After the first coat of paint, but before the removal of the water tank. Previous Lamb’s ear- you can grow that! Next Water Garden- you can grow that!